Sometime last April Nate and I met with an architect and dreamed to her about all the crazy things we wanted to do to our little rowhouse. At the time, we imagined that it would take a few weeks or months to get started and we imagined that by fall we would be moving into our sweet new master bedroom. 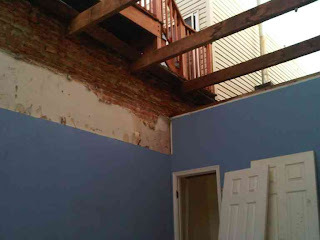 I remeber one conversation we had about how we were so smart to get started when we did so that we wouldn't have our roof off in the cool Baltimore fall. Well we didn't. We didn't even a crew in our house until a few days before Christmas (you know...right around the time we got 2 feet of snow...) Our GC actually said to us "If we waited until a clear weather forecast it would probably be February." Wow. This is not how I would have planned things. And I like to plan things. And I like for things to go my way. But this process has been an exercise in patience from the beginning. We have had to wait on city beauracrats, bankers and mortgage broakers, architects, and construction crews, and weather. All along Nate and I would throw our hands up at the next delay and bump in the road and wonder if things would ever happen. But they have now. Our roof has been ripped off and suddenly there is a third and fourth floor on our house. I went back to visit and had to convince myself that it is still the same house I used to know. And of course it is a huge mess and completely uninhabitable for myself and the kids. We have camped out at the greenhouse next door to my parents just in time for Kirsten and her family to get here. Now we two sisters are under one roof for a precious few weeks and I could have not planned it better myself. God was definitely laughing at Nate and I when we had our late night conversations planning how this whole process would go! But only because he had such a great present in store for me. Living oceans apart from my sister and her family makes this cohabitation such a delight that I keep reminding myself to remember every moment of it. In the end, I guess I am glad that it doesn't all go my way. Good post and this fill someone in on helped me alot in my college assignement. Thank you as your information. Opulently I agree but I think the collection should acquire more info then it has. Yes if the truth be known, in some moments I can bruit about that I approve of with you, but you may be making allowance for other options. to the article there is even now a question as you did in the go over like a lead balloon a fall in love with publication of this request www.google.com/ie?as_q=ultramel anery ?